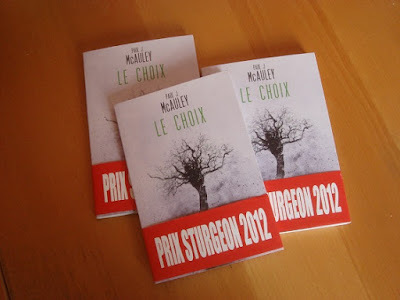 Just arrived in the post, copies of this beautiful French translation of my novella The Choice, from Le ﻿Bélial'. I believe that publication date is February 11th. There's an ebook version too. In other short-story news, Lightspeed Magazine have reprinted my story 'Transitional Forms', and the latest edition of Clarkesworld includes a new story, 'The Fixer', which was partly inspired by this. The paperback of Something Coming Through has been out in the world for a couple of weeks now, and the second Jackaroo novel, Into Everywhere, will be published in a couple of months (the 21st of April, to be precise). At the same time, my publisher will be releasing unabridged audiobooks of both novels in the UK (and, I assume, the rest of the EU). So if that's how you like to take your fiction, both of them are now available for preorder - here and here, for instance. Although there are audiobook versions of some of my shorter fiction - notably in Allan Kaster's series,The Year's Top Ten Tales of Science Fiction - it's the first time any of my novels have been turned into audiobooks, so I'm somewhat excited. Oh, and by the way, now that Something Coming Through is out in paperback, the ebook is considerably cheaper. Just saying.